An elderly gardening friend complained recently that nurseries are full of ‘new’ plants that she is unfamiliar with: “not just new hybrids and cultivars but plants I’ve never seen in nurseries before”. One of the reasons for this is the work that plant breeders are doing to discover the commercial potential of overlooked genera. Thirty years ago it was hard to find a single form of Agastache, even in specialist nurseries. Now, having discovered how floriferous and how long-flowering they are, plant breeders are producing lots of new varieties that are filling the shelves at garden centres. 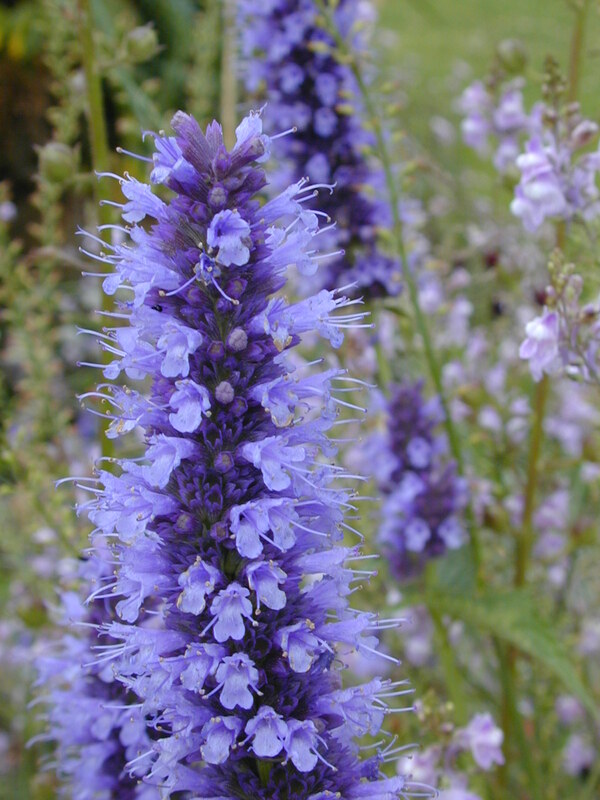 Of the dozen species of Agastache, one is found in Asia and all the rest in America, from Mexico to Canada, where they grow in sunny situations in free-draining soils. The plant is characterised by aromatic foliage that evokes, depending on your nose, aniseed balls, Pastis, spearmint or even Vicks cold remedy. The flowers themselves are tightly packed at the top of the plants stems in the same way that those of wheat and barley are. Most members of the genus start flowering in late July and will continue until the end of September. Despite their origins in temperate climates many species are not reliably harder in the wetter conditions on northern Europe. The hardiest Agastache is the Asian species, A. rugosa. This grows to about 1m tall, has pale green foliage and violet-blue flowers. It has produced several cultivars. A trial of the genus by the Royal Horticultural Society in 2004 found that many supposed Agastache hybrids were in fact cultivars of A. rugosa. A. rugosa ‘Golden Jubilee’ has violet-blue flowers against acid-green foliage. The flowers of A. rugosa ‘Honey’ are a much stronger blue. At the other end of the hardiness scale is A. aurantiaca from Mexico and Texas. It has pale orange flowers and much smaller leaves than A. rugosa. Although Agastaches are perennial plants, they will usually flower in the first year after sowing. This means that very tender ones like A. aurantiaca can be used as summer bedding, prompting growers to develop varieties that are easy to raise from seed. A. aurantiaca ‘Apricot Sprite’ has bright orange flowers that will last until the frost stops them. Thomson and Morgan have introduced a range of compact plants, about 35cm tall, called Agastace aurantiaca ‘Party Mixers’ that are named after cocktail drinks. Their short stature makes them suitable for growing in pots but they get lost in the border. One of the drawbacks of the seed-raised forms is that they produce masses of seedlings, that, if you let them flower, are often inferior to the parent plant. The hybrids and named varieties are produced commercially by cuttings and by micro-propagation and are usually hardier than the seed strains. I did not expect any to survive the harsh winters of 2010 and 2011, even on my sandy § but both A. ‘Blue Fortune’ and A. ‘Black Adder’ are thriving. The former has pale-blue flowers and the latter, as the name suggest, very dark blue ones. 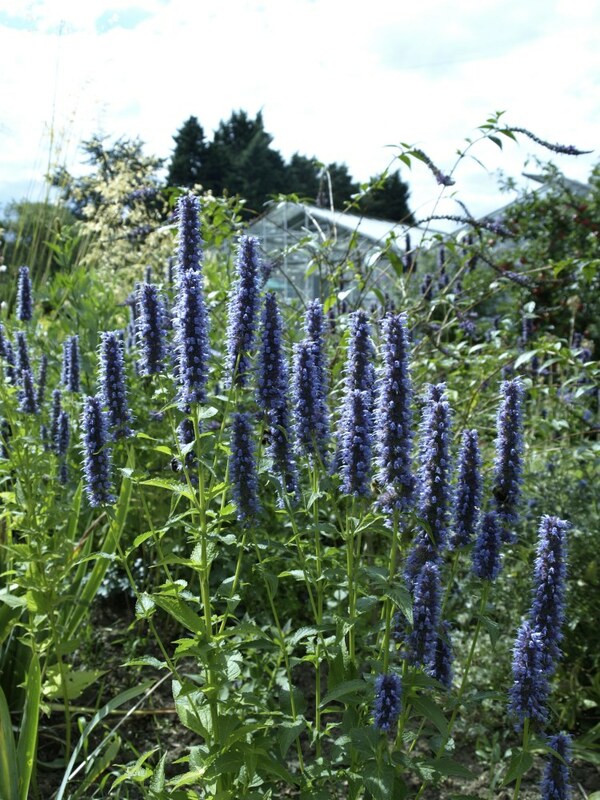 Agastache ‘Serpentine’, a 1.2m tall hybrid with bright violet flowers also survived but is noticeably less vigourous after the challenges of the winter. More surprisingly one of the grey-leaved forms, A. ‘Tangerine Dreams’, has made it through to the other side. It has pale-orange flowers with dark-red calyces and grows to about 1m tall. As long as they are in full sun, Agastaches will adapt to a wide range soils. They do best in poor, well-drained soil. If the soil is too rich they produce weak stems that flop over; if it is too wet the plant rots away. Even on dry soils it is a good idea to plant Agastaches with the crown just above the surface of the soil. If you live in an area with high rainfall or have heavy soil, it is a good idea to mulch them in the winter with horticultural grit. This will help keep water away from the crown of the plant. To grow from seed, sow the seed in late March in greenhouse or cold frame. Seedlings should be large enough to be pricked out two weeks later and the plants ready to be hardened off in early May. They should start flowering in late July. None of the Agastache are long-lived so take cuttings in early September to ensure you have a constant supply of new plants. Alternatively, divide large clumps in the spring.